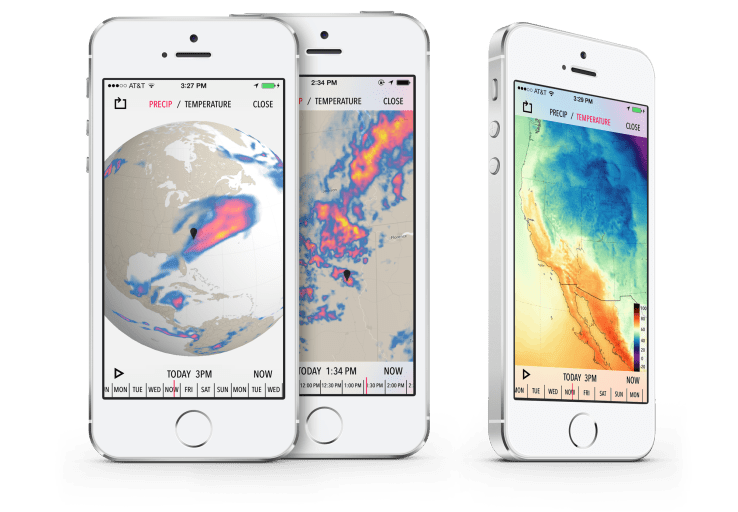 The app goes beyond just predicting approaching rain or snow, with the home screen summarizing current temperature, “feels like” temperature , sky conditions & temperature trend for your whereabouts along with the hour’s expected precipitation. One tap on the map icon brings up Dark Sky’s signature precipitation and temperature maps (animated with a tap on the play button) that can be viewed from a global scale down to your local patch. 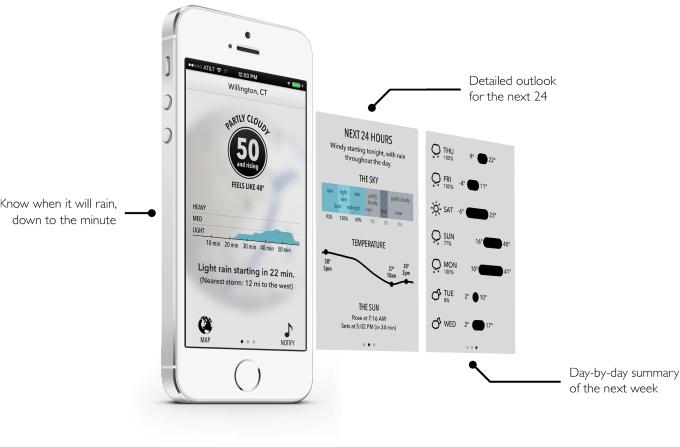 A tap on the home screen temperature button pulls up a virtual weather station for your location with wind speed & direction, humidity & dew point, atmospheric pressure and trend, and visibility. A quick swipe to the second screen shows the 24-hour precipitation and temperature prediction trends and sunrise/sunset times. A final swipe to the third screen has the week’s forecast summaries, with each day’s weather summarized by an icon and low/high temperature bar. Tapping any day of the week brings up a more detailed hour-by-hour forecast for that day. Having a handle on the weather is a key part of anyone’s birding endeavors, and I have a feeling that this will be the first app I’ll launch to inform my weather-based decisions. Perhaps the only component I’d like to see added would be a map layer showing winds, like on this amazing Wind Map page. For more features like current weather station reports, storm tracks, lightning strikes, severe weather alerts, front maps, etc. there will always be other apps in my weather folder (like Weather Underground, WX Alert USA, & Hi-Def Radar.) The real beauty of this app is its uncluttered effectiveness and stunning visualizations, a textbook example of “less is more.” It is hard for me to imagine a better way to spend four bucks improving my app library. Unfortunately, Android and other platform users are going to have to be patient in getting this one- for now and the foreseeable future Dark Sky is available only for iOS. Any other killer weather apps with an eye particularly toward birding utility? Leave ’em in the comments!